This is part two of Melos Exelion’s The Battle for Fade, if you haven’t done so already, you should catch part one here. On 9 May I joined another large Horde fleet to defend the onlining of two new PH citadels; an Astrahus (medium) and a Fortizar (large). We formed two full fleets, Cormorants and Feroxes, with local chat climbing to over 1,000 members. Time dilation started to kick in, and then quickly vanished as CCP likely brought more server power to bear to shore up the system. After some initial excitement about the possibility of a large battle, the FC broke in with some cold water. Horde reshipped into one fleet of Rifters and Merlins for the newbeans, and another of interceptors for the more experienced pilots. Not having interceptors trained up yet, I grabbed a brand new Rifter which I named Hubcaps. Having the money myself, I bought it off contract, while the poorer beans got them free from the FC. Launching again, the 500 pilots from Horde were joined by several hundred more from HONOR, TEST and Darkness, and we then spent the next few minutes chasing DaBigRedBoat and his 120 or so interceptors around the O1Y station, while the citadels anchored themselves unmolested. As the Fortizar finished anchoring itself some 1,000 km off the O1Y station undock, someone on Mumble started a countdown, “Get ready for local spam. Five, four, three, two, one, it’s up!” Local was immediately drowned out with hundreds of Horde spamming their macros. Stragglers on both sides continued to be picked off, but the highlight of the ongoing skirmish was when a wing of TEST bombers launched a run on DBRB’s interceptors just as they warped out… and we warped in after them, leading to the accidental destruction of nearly the entire Rifter fleet! I actually never even saw the bombs coming. Just a bright white light the instant after I came out of warp. Hubcaps ended its brief life gloriously and I was podded, adding myself to some TEST bomber pilot’s no doubt impressive killboard. Our FC was not amused, and I imagine the TEST pilots involved felt at least a little bad about it, but I found the whole thing hilarious. The Goons also managed to take out a large portion of Gobbins’ interceptor fleet with a bombing run of their own, but about an hour later he led another frigate fleet into a brawl with the remaining Imperium ceptors led by DBRB. The fight spilled into the citadel undock, and the now fully armed and operational Hordestar got in on the action with its point defense, finally clearing the enemy from the space around our new star fort, and turning Travis Keikira into a semi-permanent fixture in the Fortizar’s gunner’s seat. If the enemy hadn’t been able to shift us out of O1Y before, they were going to have an even harder time now, as we admired our handiwork, initially named “Blessed Papi City,” before being quickly renamed by popular acclaim to “Pillow Fortizar.” A steady stream of ships quickly began moving between the citadel and the station, as Hordlings started moving into their new home. 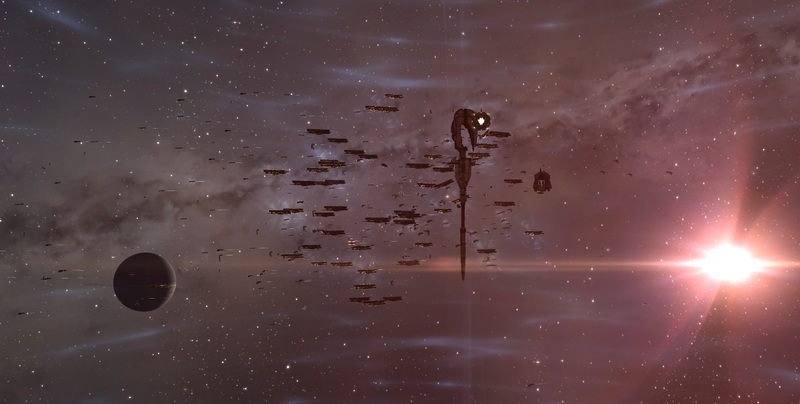 On 10 May we received word that several GSF citadels had been dropped simultaneously, all timed to anchor right after server downtime on 11 May. Due to the daily maintenance on the servers, all players online at that time would be booted from the game, and fleets would have to be hastily reformed in time to contest the 15 minute repair window of the citadels. With four Goon Astrahus citadels known to be anchoring in Fade, this would require some careful organization by the MBC. I set my alarm clock for the early morning, and woke up in time for some necessary coffee before logging in, jumping in the called-for Rifter frigate, and gathering at our rally deep in an empty system. Downtime hit and we all logged off, while waiting impatiently at the client frontend, and chattering with anticipation on Mumble. After what seemed like an age, but was really just a few minutes, someone called that the server was back up, and “Go! Go! Go!” I logged back in, and popped into space as the 50th person in local, which quickly ballooned to 100, 150, and then over 200. Fleet was back up, and I quickly rejoined. We quickly split into four groups, dispersing by wings and heading for four separate systems. I was in Wing 2, and our assignment was the YKSC-A system. Sure enough, an Astrahus was there, entering its repair cycle, and we dove in and attacked, spraying little autocannon EMP rounds all over its massive structure, and wondering if we would really be able to kill it in time. Three dreads from Darkness appeared in a swirl of redshift, and added their prodigious firepower to our own popguns. Newbean orbits adjusted chaotically to compensate and avoid coming too close to their position. A single Imperium interceptor warped in 100km off the Astrahus, then burned away and jumped clear as a dozen ever optimistic Hordlings in Rifters attempted to close on him. That was the only action we saw, but at one of the other citadels we heard some excited calls as a Hound stealth bomber with a covert cyno decloaked, but was killed before he could attempt any more mischief. 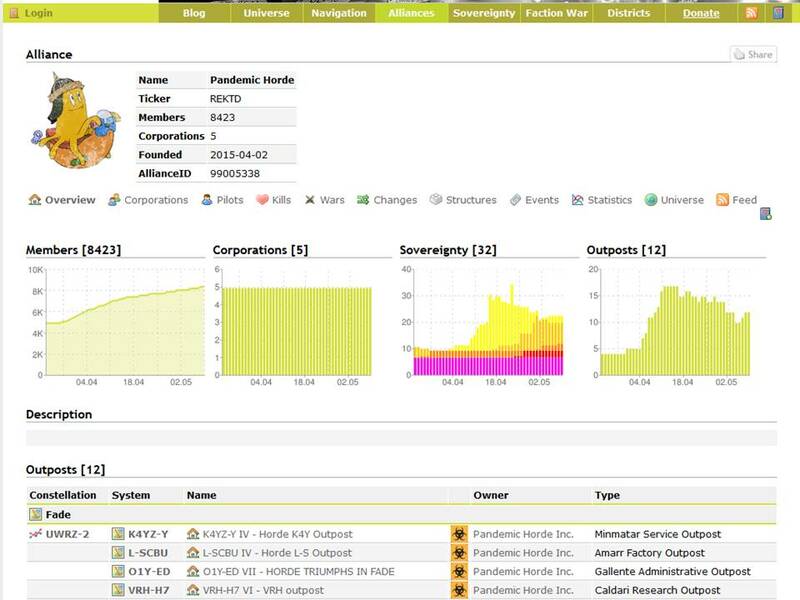 FCs for the various wings called out their progress, “GME at 15%;” “YK at 30%;” “DO6 at 20% and falling fast,” “O-C at 40%.” Pounded on by a full house of Darkness dreadnoughts the Astrahus at GME-PQ in western Fade was the first to die, with the others following in quick succession. It turned out he was in fleet and on coms, although had keeping a low profile before his outing. Being new to EVE, and not having read that book myself (I’m waiting for the hardcover to become available in Canada) I had no idea who Jade Constantine was, but several members of the fleet had a bit of a fangirl moment as our stealthy celebrity identified himself, saying that current events had brought him back after a long hiatus, and congratulated us on our success. Hype levels continued to rise as news came in of successful operations elsewhere, including Pure Blind and most critically in the Imperium’s staging system of Saranen, where PL and NCdot had taken the hardest target and successfully destroyed it. All told, six GSF citadels had died within minutes of each other. Although Horde faced no resistance in the citadel bashes in Fade (I heard that after the citadel in Saranen died the MBC forces got in a bit of a fight with a Goon battlecruiser fleet there), it was still exciting to wake up early for, and a real morale boost to see that we could co-ordinate dispersed operations on that kind of spread and scale, on such short notice. Also, citadels make a very satisfying KABOOM when they die. There was a definite feeling in fleet that with our citadels up and active, and the Goon’s citadels exploding before us, we had reached a turning point. MBC entosis operations had also managed to freeport all but two of the Imperium stations in Fade, meaning that with their citadels now destroyed we would soon have a chance to put the them on the run across the region. The next day, Gobbins announced that Horde would be moving officialy from Querious to Fade, which would become the home for REKTD for the foreseeable future. 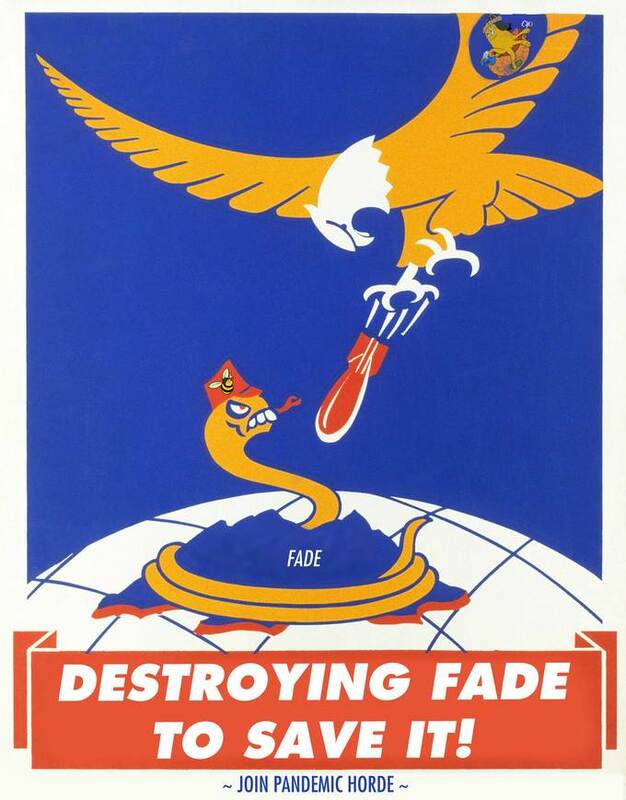 Far from being demoralized and routed, the fighting over the past several weeks had proven that we could not only hold Fade, but thrive there – if not to our enemies, then at least to ourselves. It definitely felt good to be in Pandemic Horde. As of this writing Fade remains contested, with Horde holding on to the northern UWRZ-2 constellation and the western VNX-PO constellation, and the Imperium retaking and entrenching in the southern 7X-X1Y constellation, and contesting the eastern XFLN-F constellation. With Horde’s fortification in the north complete, the MBC has returned to the offensive in Fade, and as of 13 May has successfully captured all the Imperium stations in the south. 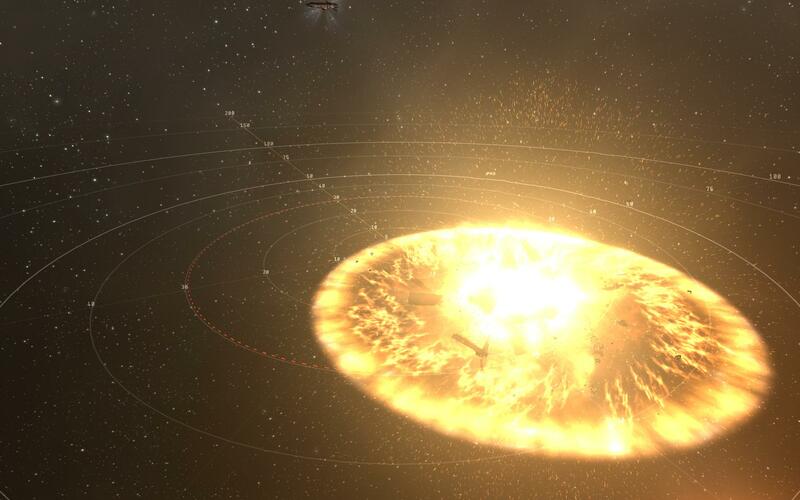 Since 16 April, over 1,000 ships have engaged in PvP each day around O1Y in the UWRZ-2 constellation, with between 15-30 billion ISK in ships destroyed daily, and as high as 50 billion ISK in ships lost on at least two days (16 April and 30 April). 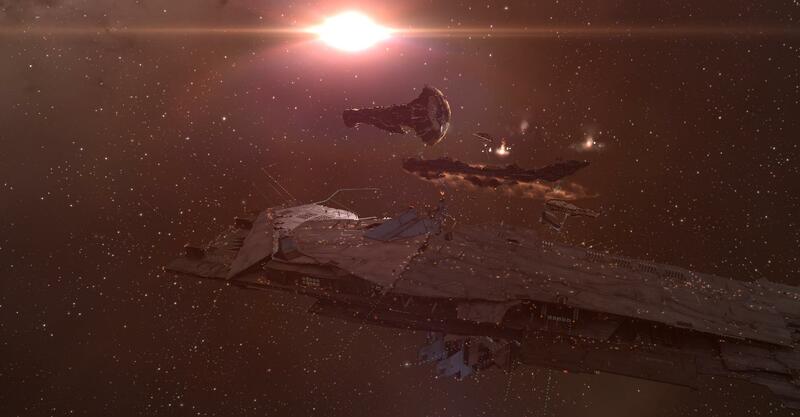 All told, in nearly four weeks of the heaviest fighting from 16 April to 12 May, over 30,000 MBC and Imperium ships worth over 500 billion ISK have been destroyed in the ongoing Battle of Fade. The Mittani in his twitch speeches and chat pings has talked about how the Imperium offensive into Fade is intended to crush Horde’s spirit, as part of the ongoing Hellwar. This must be taken as the usual florid Imperium propaganda – The Mittani can no more easily “break” Horde by re-conquering Fade than the MBC could break Goonswarm by conquering Deklein. And in fact as the balance of forces currently stand, Horde defensive resilience makes it unlikely that the Imperium could reconquer Fade in the first place. In fact, Horde’s membership has continued to rise throughout the offensive, as more and more new players sign on to fight in a war that has now come right to them. While this is true, in my experience what really breaks player morale is futility. 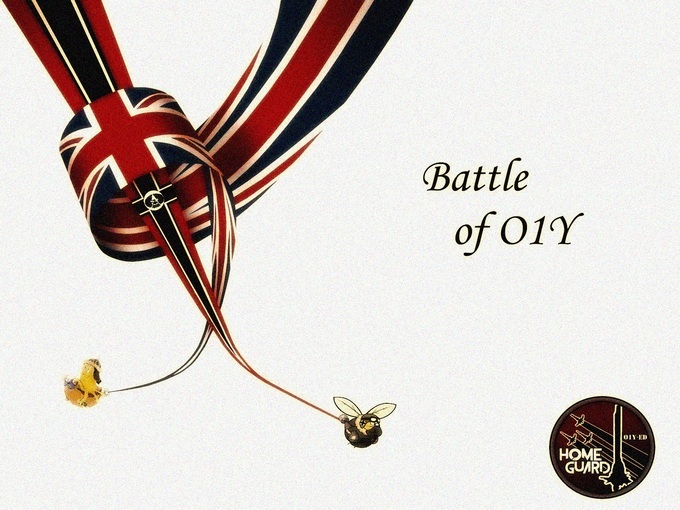 A battle lost for nothing is crushing, but a battle lost with the knowledge of a greater goal achieved, or a future opportunity gained by the current sacrifice is less so (I speak with limited experience in EVE, but a great deal of past experience in World War II: Online – another game with large scale battles and long term effects from victory and defeat). Most players also don’t mind when things are going badly for their side so long as they personally are scoring victories – but only to a point. Taunts by MBC members that the Goons have remained docked throughout much of the war are often met by angry responses from Imperium members who point out that they have sortied many fleets. Nevertheless, in the first half of April these fleets had little effect in slowing the rapid pace MBC conquests, particularly in the key region of Deklein where the pre-existing Goon defense plans were undermined by MBC moves (see Lazarus_Telraven, 2:00:27). Logging on to do nothing, or to repeatedly perform actions that do not appear to meaningfully affect the course of a war also bring feelings of futility, and commensurate morale hits, lowering log-in counts. To counter this morale hit, Horde provided a ready target that would engage at will with numbers and a great deal of enthusiasm, but not as much in the way of quality and skill. Attacking Horde would allow the Imperium large fights it could win and sov it could retake. Although in my experience, Horde often gives as good as it gets, and the fighting has by no means been one sided. Horde’s cheap ships and rookie pilots have certainly allowed Imperium veterans to rack up impressive personal kill tallies, and that does matter. The offensive proper probably grew organically out of initial successes, rather than from some grand plan. Strategically, it would have been better for the Imperium to continue to wait a few more weeks after the fall of Deklein and let the MBC continue to fracture from inactivity and boredom. Horde, as a large alliance based around finding PvP content, also makes a questionable target for an attack intended to break our will, when boring us to tears would probably see greater results. Yet boredom cuts both ways, and in the end everyone playing EVE is here to interact in a game, which means having fun. Certainly, the Imperium pilots involved in Fade say they are enjoying themselves – as do those from Pandemic Horde, and its allies who I have had the immense pleasure of flying and fighting and dying with. In the end, flying with friends, blowing up and getting blown up by other people who are also having fun flying with friends is what this is all really about. A retired Canadian Forces member and amateur historian who decided it was time to stop being scared of spaceships and spreadsheets and take the plunge. 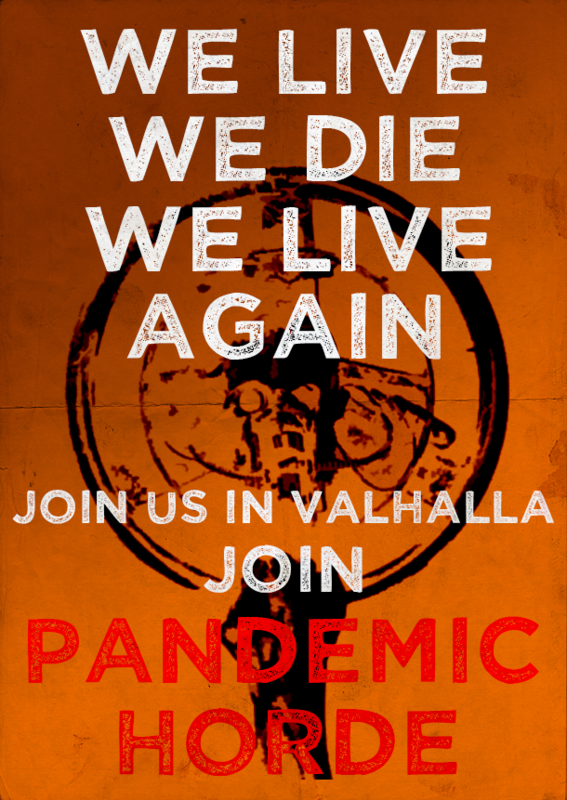 Joined Pandemic Horde for the war, and is now drowning in karaoke and local spam.